Bert McIntosh owner of McIntosh Plant Hire (Aberdeen) Limited, at their workshop at Birchmoss Plant & Storage Depot. A family-run business has been forced to leave 12 posts unfilled as it battles to find an extra £14,000 in business rates – every week. 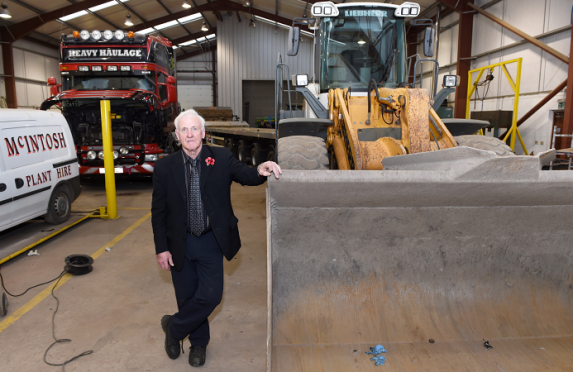 Bert McIntosh has vowed never to lay off any of his employees at the Echt-based haulage and logistics firm founded by his father. But a whopping 220% increase in his liability means he has been unable to replace a dozen staff who have left or retired since last autumn. And he has also been forced to offer tenants rent cuts in a desperate bid to protect the income from recently-developed industrial units. The veteran businessmen was among the first to speak out over the huge hikes when he was told his bill was going up from just over £300,000 to more than £1million a year. Despite since securing some reduction, he remains furious at the way the north-east has been treated. Firms in the region have been asked to shoulder half of the entire rise in rates across the whole of Scotland, the government’s own figures show. Mr McIntosh, whose workforce is now down to 50 from 62 less than a year ago, said business appeared to be recovering after the downturn. “How the hell is the money to be found?” said the businessman, who still works every day into his 70s. “How on earth can we get business to accelerate at that speed? The market is just not there for it.